The health of Virginia’s rivers and streams is paramount to a strong economy and environment. The Commonwealth is blessed with natural aquatic wonders such as the James River and the Chesapeake Bay and has a storied history of responsible water conservation. Nonetheless, litter pollution in the watershed has long been an unresolved issue. Burgeoning research detailing the consequences of unchecked plastic pollution on waterways, wildlife, and human health has created a new urgency to the matter. What kind of litter is most commonly found in our waterways? The main culprits, by prevalence: cigarette butts; plastic bottles; plastic bags; food wrappers; and fast-food cutlery such as straws, cups, plates, forks, knives, and spoons. Where does the litter come from? Deliberate littering and illegal dumping in streets and parks are certain contributors, but litter is more often unintentional. Overflowing, unsecured trash and recycling receptacles from homes and businesses contribute a substantial portion of litter debris. Currently, municipalities are given inadequate tools to control this kind of litter. Consequently, the litter is conveyed into waterways through the local stormwater system. During a rain event, uncontrolled debris is swept from streets into drains that flow directly into out-of-sight streams. From there, the litter is either permanently deposited into local tributaries or swept into larger bodies of water, such as the Chesapeake Bay or Atlantic Ocean. According to the Environmental Protection Agency, 80% of marine debris originates as land-based trash. Litter is far from just an eyesore — its impact on water and habitat quality is wide-ranging. Ingestion or entanglement often proves fatal for wildlife. Turtles, birds, fish, mammals, and important filtering bivalves like oysters and mussels mistake plastic items for food.2 Flooding from storm drain blockages due to litter is also common. The Virginia Department of Transportation estimates that it spends $6 million a year picking up litter on roadways (not including its Adopt-A-Highway program, which provides annual savings of $1.35 million) — this only scratches the surface of the overall economic impact. The use of plastics, which has exponentially increased in recent decades, poses a significant threat to Virginia’s waterways. Plastics — especially bags and bottles — fragment into increasingly smaller pieces, which are nearly impossible to remove from water and soil. The resulting microplastics do not biodegrade (e.g. they maintain their unique chemical properties even as they are no longer easily seen). Research finds that plastics can leach potentially harmful chemicals into water, and furthermore, they attract other persistent, bioaccumulative, and toxic (PBT) chemicals that can be passed back up the food chain via seafood. One recent study found microplastics in 98% of all water samples from the Chesapeake Bay, and both the Virginia Institute of Marine Science and University of Maryland are currently researching microplastics’ effects on sediments and submerged aquatic vegetation, the bedrocks of the ecosystem. Notably, Virginia is the first state on the East Coast with a plan in place to reduce marine debris — the Virginia Marine Debris Reduction Plan.5 While the plan outlines goals and priorities for local governments and nonprofits working on this issue, legislators are in a unique position to contribute to water quality improvements. Neighboring lawmakers are steps ahead, making significant strides with commonsense policy. Washington, D.C. and Montgomery County, Maryland have both implemented a polystyrene ban, as well as a five-cent fee on plastic bags to address the Anacostia River’s pollution problem. City officials reported a 50-70% decrease in household plastic bag usage, and the Alice Ferguson Foundation reported similar decreases during recent cleanup inventories. Revenues from the bag fee ($2+ million annually) are used to implement education, trash capture, and stream restoration projects throughout the Anacostia Watershed. Additionally, funds are used to distribute reusable bags to low-income and aging populations throughout the District.6 In contrast, over the past few decades, the Virginia General Assembly has failed to pass several versions of a plastic bag fee law, as well as a bottle bill that would allow each local jurisdiction to decide what’s best for its own needs. 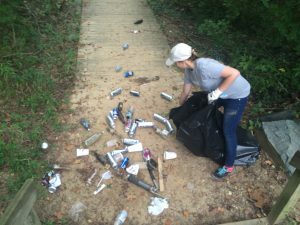 The Commonwealth of Virginia must take a proactive approach to litter prevention and reduction to sufficiently protect its natural resources. The Virginia General Assembly must take a leadership role on this issue and carefully consider plastic’s staggering ubiquity in our local waterways and coastal waters. Virginia should encourage businesses — as well as citizens — to reduce waste generation. China’s ban on United States’ trash and recyclables is a clear indication that there should be an expanded emphasis on waste prevention — not just recycling — in the region. Failure to do so could result in over-stressed landfills and a further imperiled environment. The Litter Tax (58.1-1707) — an annual $10-25 fee (established in 1977) on retailers that sell commonly littered products — needs to be adjusted to account for 41 years of inflation. Legislators must consider allowing local jurisdictions to invoke fees or bans on commonly littered items, such as single-use plastics. Furthermore, any legislation with a possible fee-based structure should consider diverting said funds towards cleanup programs or education that helps reduce waste.